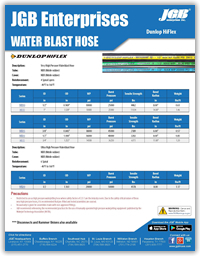 Waterblast WB20 Hose - Dunlop - Hose by Vendor - JGB Enterprises, Inc. The WB20 Series hose is designed for ultra-high pressure waterblasting. • Restricted to use as high pressure waterjetting hose where safety factors of 2.5:1 are the industry norm. Due to the safety critical nature of these very high pressure hoses, it is recommended that pre-fitted and tested assemblies are sourced. • No warranty is given for assemblies made with non-approved fittings. • JGB recommends referencing the recommended practices for the use of manually operated high pressure waterjetting equipment published by the Waterjet Technology Association (WJTA).